Back when I was in high school, I listened to a lot of hip hop. In particular, I loved Del The Funky Homosapien and pretty much everyone in his Hieroglyphics crew. In 1994 there was a rapper from this crew named Casual and he put out what is probably one of my top three favorite hip hop albums of all time, Fear Itself. While that Casual has been around for quite some time and has put out several other albums, I don't think he was ever truly able to capture that lightning in a bottle perfection of his first album. I still throw it on from time to time and am just as big a fan of it now as I was twenty one years ago. Fast forward to 2015 and we have a band, from New Jersey no less, also called Casual. Right away I'll admit to being concerned as they used a band name that was kind of already being used, albeit, not by an actual band. I will also admit that I've been pretty tough on bands from my home state over the years and can't say too many have ended up in my collection. That being said, I trust Dead Broke so I picked this up. 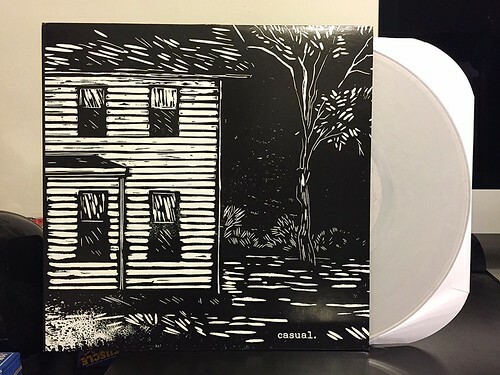 While I can't say I was knocked out of my chair like I was when I hear Casual the rapper for the first time, this Casual has put together a pretty strong album of gritty, but melodic punk. To me they sort of sound like a cross between the gruff punk of bands like Iron Chic and the kinetic guitar rock of Sundials. Vocally, they definitely lean closer to Sundials, with yelping vocals that are enhanced with some female backing vocals to produce some nice harmonies that really elevate some of the songs. I wouldn't plant my flag and proclaim this one of the tip top best albums I've heard this year or anything, but if you like your punk poppy (which I do) and enjoy when a band is bristling with energy and hooks (check) then Casual is absolutely worth giving a whirl.